A really useful and substantial lemon juicer. Fantastic quality with a pouring spout. "BOTANIC GARDEN". SMALL LIDDED STORAGE JAR. (see IMPORTANT below). Apologies in advance for this! ♻️ Reduce Re-Use Repair Recycle Regift ♻️. Two Dinner Plate - Hydrangea. Dinner Plates Hydrangea Macrophylla. one spot pottery blemish to surface. within 24 hours. We try to describe the item to the best of our ability but none of of us are perfect. 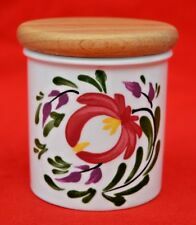 VINTAGE PORTMEIRION: 'WELSH DRESSER' SMALL STORAGE JAR - SUPER CONDITION! The interior of the jar remains in good, sound, bright condition - once again as I have shown. The perfect item for herbs or spices. and perfect for display! This item remains in entirely sound, clean condition. VINTAGE PORTMEIRION: 'WELSH DRESSER' TINY STORAGE JAR - SUPER CONDITION! A vision of spring as we head towards Winter this lovely bowl will brighten any Breakfast! Bowl - Bellis Perennis. Bellis Perennis - Daisy. Very Good Condition little sign of use. We try to describe the item to the best of my ability but none of of us are perfect. Kastcollectables is a Small Family Buisness. 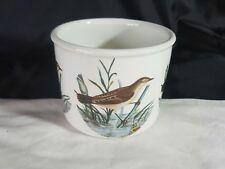 Portmeirion Broom 'Botanic Garden' Butterflies 8 cm Sugar Bowl Excellent Condit. 'Botanic Garden'. 8 cm Sugar Bowl. Height: - 8 cm. of Mouth: - 9 cm. IT IS REQUIRED. HOWEVER IF. AS IT WILL BE. THE COST IS. Narcissus Minimus - Small Narcissus. Oval Twin Serving Dish - Narcissus Minimus. Oval Twin Serving Bowl Dish. Very Good Condition with little sign of use. We try to describe the item to the best of our ability but none of of us are perfect. Dinner Plate - Amaryllis Reginae. Dinner Plate Amaryllis Reginae. from plate display wires. within 24 hours. We try to describe the item to the best of our ability but none of of us are perfect. Kastcollectables is a Small Family Buisness. Aquilegia Gracilis - Slender Columbine. Oval Serving Dish - Slender Columbine. Oval Serving Bowl Dish. We try to describe the item to the best of my ability but none of of us are perfect. Very Good Condition with odd use marks. Very Good Condition with little sign of use. We try to describe the item to the best of our ability but none of of us are perfect. Kastcollectables is a Small Family Buisness. This is not done intentionally to deceive anybody. Primula Villosa. Primula Villosa - Blue Primose. We try to describe the item to the best of our ability but none of of us are perfect. Kastcollectables is a Small Family Buisness. This is not done intentionally to deceive anybody. Rhododendrum Liliiflorum. Dinner Plate Rhododendrum Liliiflorum. within 24 hours. We try to describe the item to the best of our ability but none of of us are perfect. Kastcollectables is a Small Family Buisness. Perfect for an apple pie! Pre-owned, but only used once before going onto a display shelf. There are a few tiny signs of cutlery use - but I had to search hard to find them. Width: 7 3/4". Three Dinner Plates -Hydrangea. Dinner Plates Hydrangea Macrophylla. within 24 hours. We try to describe the item to the best of our ability but none of of us are perfect. Kastcollectables is a Small Family Buisness. We provide this information for guidance only and will not be held responsible for oversights concerning defects, nor does a reference to particular defects imply the absence of any others.